← HELL is for REAL! Continuing our in depth study of 2nd Kefa (Peter) chapter 2 by looking at verses 4-6. As a WARNING to those in the FUTURE . . .
A warning to WHOM in the future? The opposite of “godly” is “ungodly.” These two words which are opposites are contrasted in verses 4-9 of 2nd Kefa (Peter). How you come at the text here will determine what you are able to see and understand . . . and what you will NOT be able to see and understand. In other words, your own theological suppositions (theories – dogmas) will affect your understanding of the text here. Was there a “New Testament” when this letter was written? As simplistic as this question is, many read without considering this very simple question. When this letter was written, there was no New Testament. It hadn’t been written yet – makes sense right? After all, this letter by Peter is part of the New Testament, and if he is writing it, then the New Testament CAN’T exist yet. Were these letters such as this one written to believers or to non-believers? This simple question tells us a lot about the theological suppositions that we bring to the table. We have these letters because they were written to believers that preserved them and held them dear. Would they have been copied and held dear by unbelievers? Really?!? Would these unbelievers hold them dear and take great care in preserving them for the believers of the future? Of course not! Is salvation STATIC or DYNAMIC? If you believe salvation is STATIC (one moment in time), or to be more specific, the day you gave your life to the Lord, then you will have to dismiss this “future warning” as non-applicable to you. After all, you are ALREADY saved, right? If however, you understand salvation to be DYNAMIC (a timespan – a life lived for God instead of a single moment lived for God), then this warning DOES apply to you . . . and to all of us. After all, this was written to believers . . .
Do the theological suppositions (dogmas – doctrines) that you subscribe to contradict what is being addressed here? Do they prevent you from applying the text in these verses to your life? If you subscribe to the STATIC teaching of “once saved – always saved,” this can’t apply to you because this warning can’t apply to you (you are “already saved”). To make this theological supposition work, you would then also have to believe that this letter was to unbelievers since believers are already saved. Approaching the text through the lens of man-made doctrines such as once save-always saved lead to nothing but error . . . which lead to other errors . . . which leads to still more errors. In the end, and not to put too fine a point on it, you end up teaching and following a “different” gospel. I am sure we all know what the implications of that are, right? Act irreverently (or) impiously; act ungodly. Thoralf Gilbrant, ed., “758. ἀσεβέω,” in The Complete Biblical Library Greek-English Dictionary – Alpha-Gamma, (Springfield, MO: Complete Biblical Library, 1991), WORDsearch CROSS e-book, Under: “758. á¼€ÏƒÎµÎ²á½³Ï‰”. God did not spare and God condemned. He did this as a warning. A warning to those in the future that would live ungodly lives. Thoralf Gilbrant, ed., “5177. φείδομαι,” in The Complete Biblical Library Greek-English Dictionary – Sigma-Omega, (Springfield, MO: Complete Biblical Library, 1991), WORDsearch CROSS e-book, Under: “5177. Ï†Îµá½·Î´Î¿Î¼Î±Î¹”. Who did he spare? Noach (Noah) and 7 others. Noach (‏נֹחַ‎ nōach). The name means: rest or quiet. The kērux of classical Greek was one who served a prince, king, etc., and later the state as a “public messenger, envoy.” He was a free man, so even though he sometimes performed menial tasks, he was higher than a slave on the social ladder. The duty of the kērux was to call out the message of his superior in a loud voice. The message, i.e., the kērugma (2754), could be an authoritative edict or simply a piece of important information. Thoralf Gilbrant, ed., “2755. κήρυξ,” in The Complete Biblical Library Greek-English Dictionary – Zeta-Kappa, (Springfield, MO: Complete Biblical Library, 1991), WORDsearch CROSS e-book, Under: “2755. Îºá½µÏÏ…Î¾”. What was he a preacher – public messenger – envoy of? Righteousness. אֱמֶת ’ĕmeth (583), Faithfulness (Gn 24:49); truth (Dn 8:12). זָכוּ zākhû (A2219), Innocence (Dn 6:22—Aramaic). חֶסֶד ches̱edh (2721), Kindness (Gn 21:23, Isa 63:7); love (Prov 20:28). טוֹב ṯôv (3005), Good (Ps 38:20 [37:20]). מָדוֹן mādhôn (4209), Adversity (Prov 17:14). מֵישָׁרִים mêshārîm (4478), Uprightness (1 Chr 29:17). מִשְׁפָּט mishpāṯ (5122), Just (Prov 16:11); justice (Prov 17:23); law (Ezek 18:17,19). נִקָּיוֹן niqqāyôn (5539), Innocence (Gn 20:5). פֶּתִי pethî (6864), Simple (Prov 1:22). צַדִּיק tsaddîq (6926), Righteous (Prov 15:6 [15:5]). צֶדֶק tsedheq (6928), Righteousness (Jb 8:6, Isa 11:5); fairness (Lv 19:15). צְדָקָה tsᵉdhāqāh (6930), Righteousness (Dt 9:5,6, 1 Kgs 8:32, Hos 10:12). שָׂכַל sākhal (7959), Hiphil: understand (Prov 21:16). Thoralf Gilbrant, ed., “1336. δικαιοσύνη,” in The Complete Biblical Library Greek-English Dictionary – Delta-Epsilon, (Springfield, MO: Complete Biblical Library, 1991), WORDsearch CROSS e-book, Under: “1336. Î´Î¹ÎºÎ±Î¹Î¿Ïƒá½»Î½Î·”. The legal overtones of dikaiosunē are inescapable, for even as the term invades the language of ethics it continues to carry forensic (legal) baggage. At the outset it denoted a life governed by law and order and a sense of duty. In Plato’s Utopia (ideal society) dikaiosunē is the foundational governing principle (see Plato Republic 433a). In God’s economy, is not righteousness a foundational governing principle? Is it not governed by His law? Do we not have a legal and moral duty to be righteous? Can you be Holy without being righteous? Aren’t we told by Kefa (Peter) in one of his earlier letters to be Holy because He is Holy? 44 For I am Adonai your God; therefore, consecrate yourselves and be holy, for I am holy; and do not defile yourselves with any kind of swarming creature that moves along the ground. 2 “Speak to the entire community of Isra’el; tell them, ‘You people are to be holy because I, Adonai your God, am holy. 7 Therefore consecrate yourselves — you people must be holy, because I am Adonai your God. Interesting side-note: Although righteousness (δικαιοσύνη dikaiosunē ) is used extensively in the gospel of Mattityahu (Matthew), it is NOT used in the gospel of Mark. This is one of those little pebbles in your shoe that may be uncomfortable for those of you that subscribe to Markan Priority since righteousness is a central tenet in the text. (cf. 1 Timothy 6:11; 2 Timothy 2:22). 11 But you, as a man of God, flee from these things; and pursue righteousness, godliness, faithfulness, love, steadfastness, gentleness. 22 So, flee the passions of youth; and, along with those who call on the Lord from a pure heart, pursue righteousness, faithfulness, love and peace. It is the mark of the believer, and without active “doing” there is no real relationship (i.e., righteousness) with God (1 John 2:29; 3:7,10; cf. James 2:17). 29 If you know that he is righteous, you should also know that he is the Father of everyone who does what is right. 7 Children, don’t let anyone deceive you — it is the person that keeps on doing what is right who is righteous, just as God is righteous. The one practicing righteousness may even have to suffer for it (1 Peter 3:14). 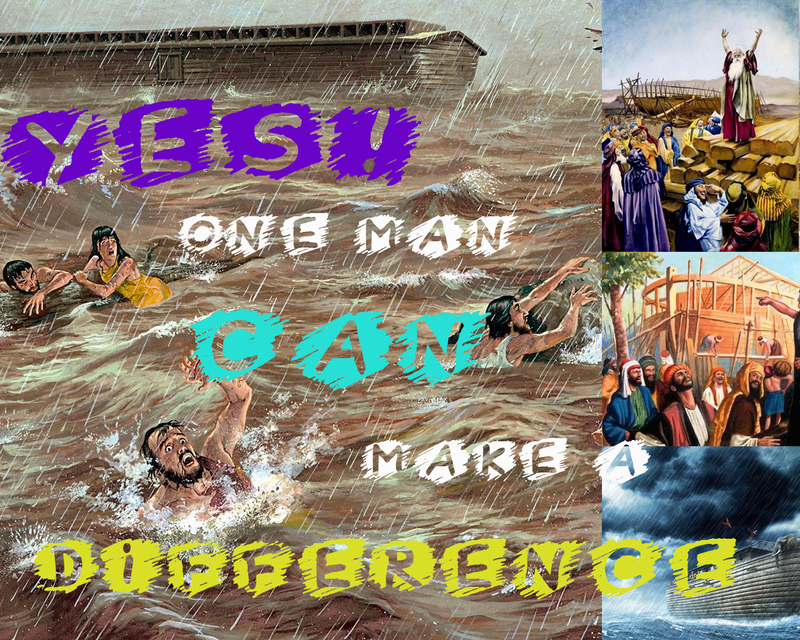 Noach (Noah) was spared because he was an envoy – messenger – preacher of “doing what is right” . . . of righteousness. Noach (Noah) was the opposite of the false teachers and false prophets in verse 1 of 2nd Kefa (Peter). He didn’t malign the true Way. He didn’t make up and proclaim false stories out of greed. He is the antithesis of verses 1-3 – he is the juxtaposition of verses 1-3. Praise God that he was!!! If it had NOT been for that preacher of righteousness – of doing what is right, then you would not be here today and neither would I because God would have destroyed the world and everything in it! that all the imaginings of their hearts were always of evil only. The wickedness of man grieved God’s heart. The wickedness of man caused God to regret that he had made mankind. Adonai contemplated destroying ALL of mankind . . . .
8 But Noach found grace (favor) in the sight of Adonai. Literally, one man doing what is right (righteousness) can change the course of humanity. This entry was posted in False Teachers and False Teaching, Word Studies and tagged 2nd peter, kefa, noach, Noah. Bookmark the permalink. 5 Responses to YES! One man CAN make a difference!